As one storm winds down, we're always looking ahead to the next one. Thus, the never-ending story of the weather. Sunday night's storm system was even more tame as expected. Yes, we saw some wintry weather — but it was light and limited to northern New Jersey only. I don't have any final snow totals to share just yet. As of this writing (about 5 a.m.), surface temperatures across New Jersey range from 26 degrees (far north) to 43 degrees (far south). Almost everything falling from the sky right now is just plain rain, although a bit of wintry mix remains possible north of Interstate 80 through the early morning hours. If you do have to embark upon a morning commute on this President's Day, you'll probably do just fine — just remember that even wet roads can be very slippery. Rain will wrap up around 10 a.m. Monday with lingering showers through about lunchtime. Clouds will give way to increasing sunshine through Monday afternoon. It will also become pretty windy, sustained at 15 to 25 mph with gusts to 35 mph. High temperatures are expected to rise to the mid 40s — although keep in mind, South Jersey is already near that point, so thermometers may not budge much there. Monday night looks mostly clear, with a continuing stiff breeze. It's going to be pretty cold too, with lows in the lower 20s — keep in mind normal lows for mid February are around 26 to 27 degrees. The coldest parts of the state (NW and Pine Barrens) could see teens. And I believe most of New Jersey will experience semi-bitter wind chills in the teens. Tuesday will be quiet. Sunny, breezy, and cool. High temperatures between about 35 and 40 degrees. —Part 1... Snow to arrive in southwestern New Jersey Wednesday mid-to-late morning, spreading through the entire state by early-to-mid afternoon. —Part 2... Starting late afternoon, snow will begin mixing with sleet (north and west) and rain (south and east). —Part 3... Rising temperatures will force a transition to all rain later Wednesday night, hopefully around Midnight. Rain is forecast to end sometime Thursday afternoon. —Bottom Line... At least some snow and ice accumulation is looking likely for all of New Jersey. Given the timing of the storm and the peak wintry weather, I am particularly concerned about sloppy road conditions during Wednesday afternoon's commute. We will be hitting the road for home just as temperatures start to warm and precipitation starts to transition. But I'll offer my usual word of caution: no matter what's falling from the sky, it could get very messy. —Confidence... I'm feeling good about the timing forecast I've put forward here, but the impacts are very much up in the air. 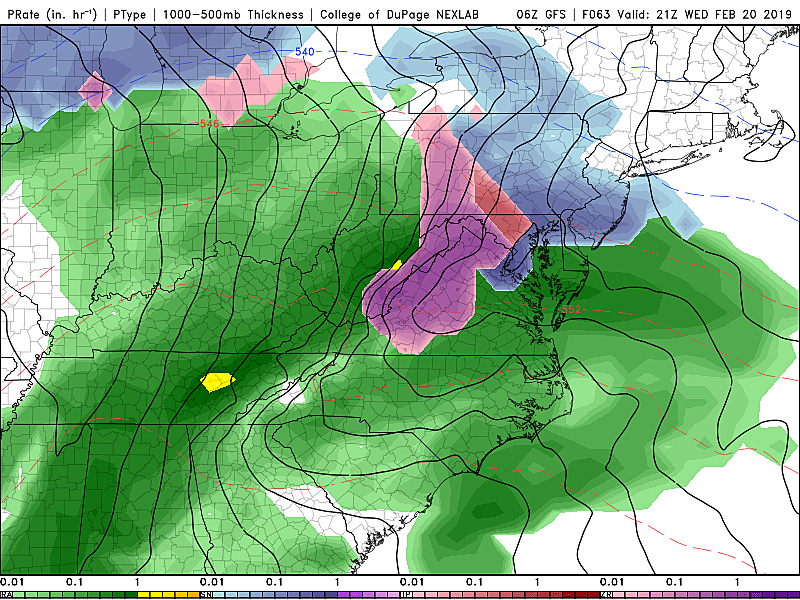 I hope to present a snow/ice map and more details by Tuesday morning. Along with the rain, Thursday will also be quite warm with high temperatures approaching 60 degrees. It won't last, of course, as cooler air returns for the weekend. (Note: cooler, not frigid.) Our next storm system, in the Saturday night to Sunday time frame, looks like just plain rain for now.